Rally-inspired Honda CRF250 special could hint at a future street-legal production motorcycle. This is the Honda CRF250 Rally, a concept motorcycle unveiled at the Osaka Motorcycle Show in Japan. Based on the Honda CRF250L. It's styling is inspired by the Honda CRF450 Rally motorcycle. 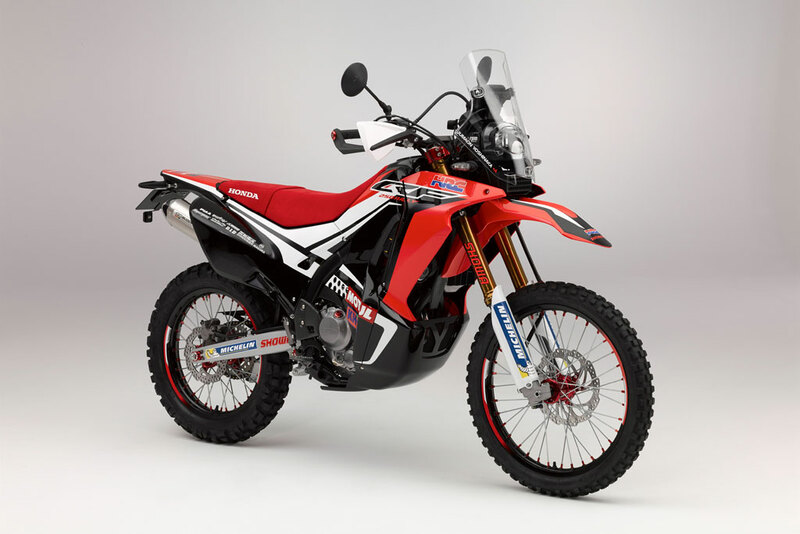 The Honda CRF250 Rally has revised body work, with a substantial bash plate joining up with the fairing, a lighter exhaust, thicker saddle, taller screen, handguards and lever protectors, LED lights, and some pretty serious looking navigation hardware. Though Honda hasn't yet announced any plan to put the Honda CRF250 Rally into production, it's interesting to note that the CRF250 Rally has all signs that it was made in Thailand and would be road legal with mirrors and indicator lights.